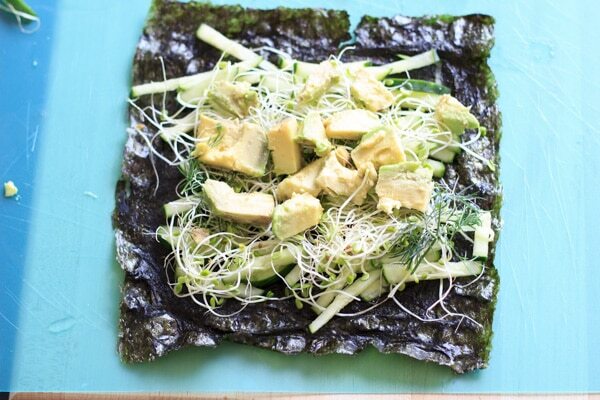 Vegan friendly “sushi” raw nori roll with only vegetables and herbs. Fun to make and to eat! A big part of this blog is meant to show you all not only what has worked for me in the kitchen, but also what has not worked. “Trial and Eater” is based off the idea that it takes much trial and error to figure out how to cook (at least for me), and you don’t always get it right the first time. Or the second or third time. 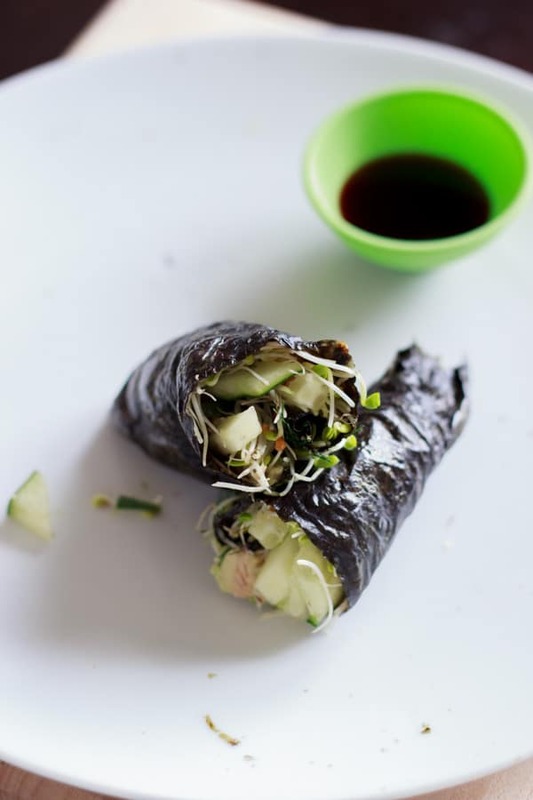 In the case of this raw nori roll, it took me FIVE times to figure out how to make this and get it halfway presentable. Five different meals of chopping up the cucumber, picking some herbs from my new garden, attempting to roll it all up and eat it. Eating it was the best part, but those first results didn’t exactly make for pretty food photography. I’ll show you how it all went down. Looks pretty easy, right? 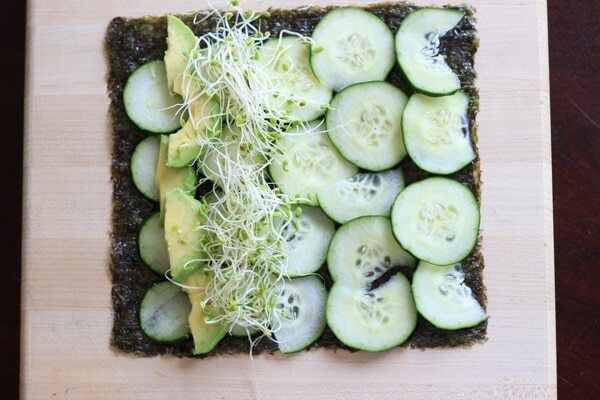 I lay out some cucumbers, avocado, sprouts and some dill on a sheet of nori. Looks good so far. I figure I just made the cucumbers too big and that’s why it wouldn’t roll tightly enough. So I try again, cutting the cucumber pieces into strips instead of slices. This time I may have put too much water on the nori roll (the package says to add some to the edges so that it sticks together after rolling). It looks a little wrinkled, but I’m gonna try it anyway. Lookie! It actually rolled up almost normal. Let’s see if I can cut it. I try again. This time I wet the knife a little, and actually cut a piece that looked like it would stay together and not all fall apart. If only that were true for the rest of the pieces. Okay, attempt #4. I don’t even know what happened here. I get the impression the cucumber is practically jumping out instead of just falling out. OKAY, let’s get it together. TRY AGAIN. I made sure all the ingredients were in the very center of the nori sheet, and not overstuffed. Instead of cutting into 6 or 8 pieces, I decide to just cut in half. Problem solved. DO cut all your ingredients (at least cucumber) into strips or small pieces. 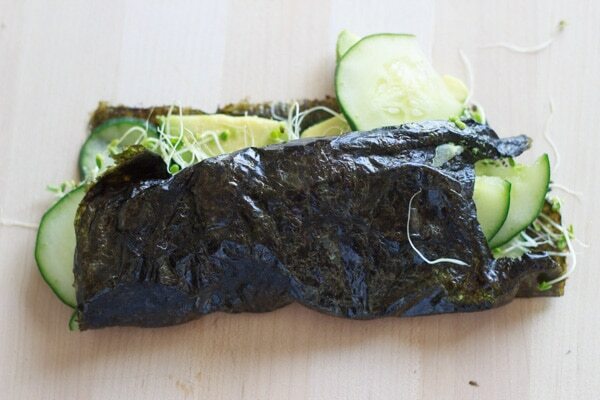 DON’T wet the nori sheet too much or else it will shrink to half its size. DO wet the knife before cutting into pieces, and you can just cut in half if you’re afraid of all your ingredients popping out. DO make sure your ingredients are not too close to the edge of your nori, or else they will fall out. 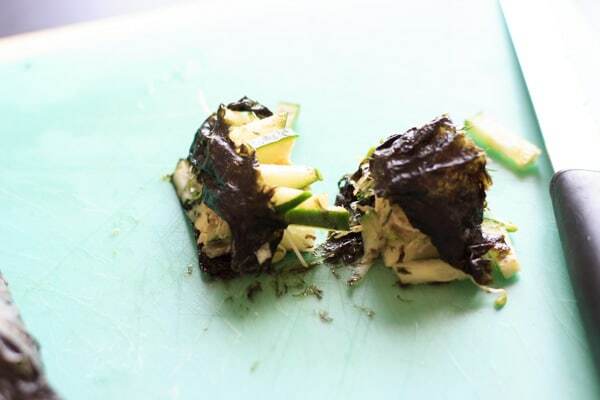 Also DO tell me if you have better luck with your own nori creations, because I need help. 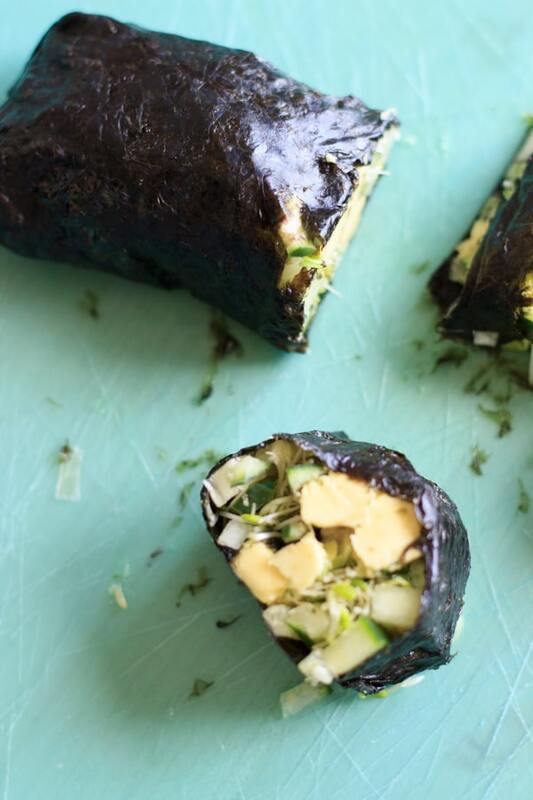 Have you ever made a nori roll? What are the tricks you’ve learned about wrapping it? 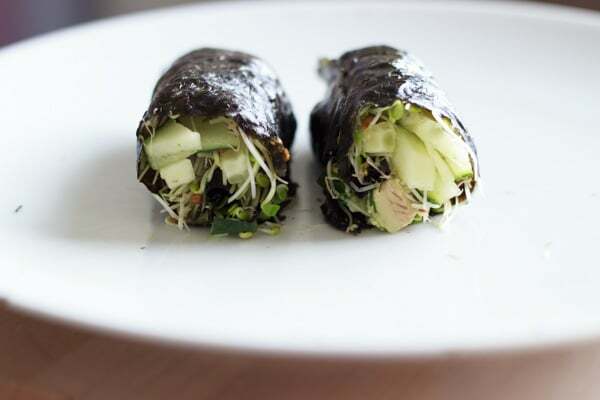 Vegan friendly "sushi" raw nori roll with only vegetables and herbs. Fun to make and to eat! 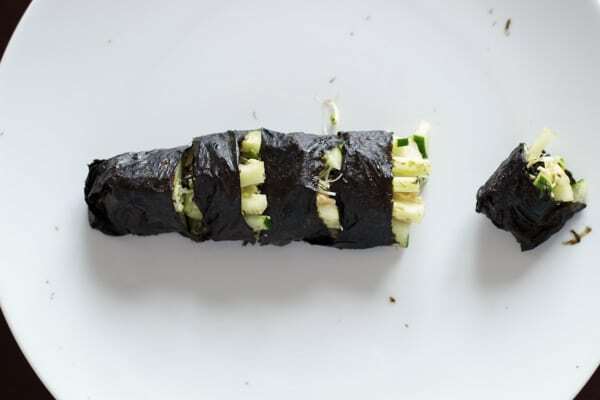 Place nori roll shiny side down on a flat surface. 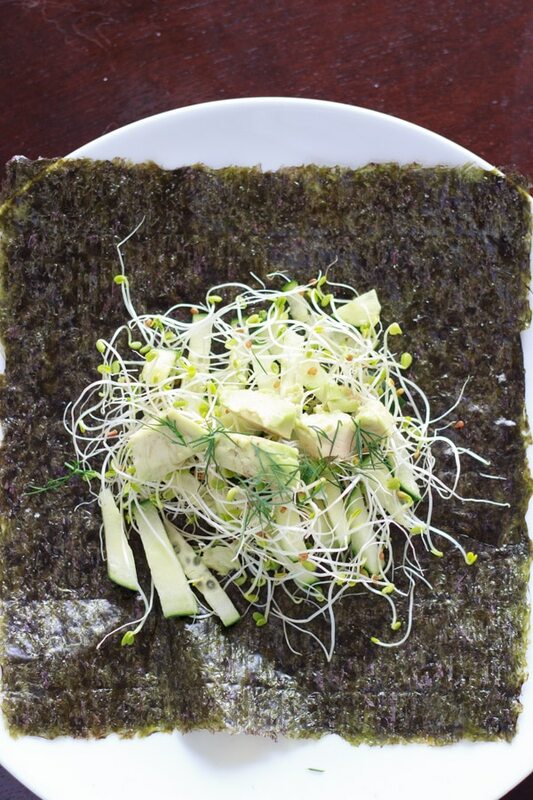 In the center of the nori sheet, add cucumber, then avocado, then sprouts and top with fresh dill (or herb of your choosing). 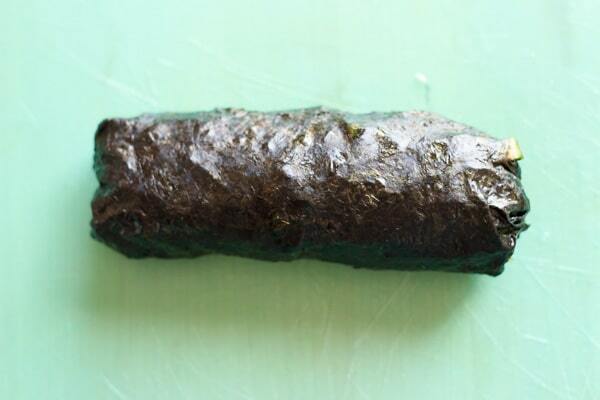 Wrap nori roll tightly, using a small amount of water to seal the last end together. Just found this post. 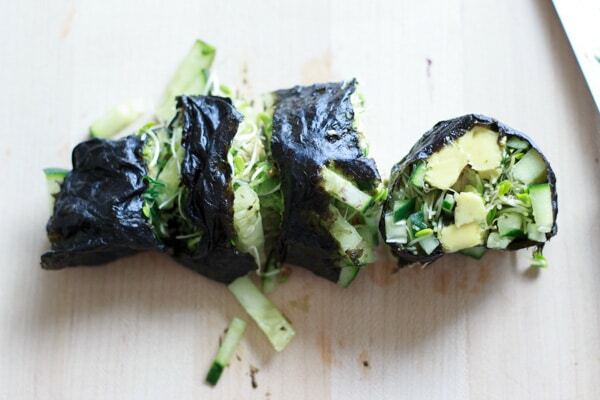 I love Nori Rolls! I’ve never used dill, but mint and Thai basil are really good. I’ve found it’s helpful to use a small bamboo rolling mat and slightly toast the nori sheet with a lighter before adding ingredients. 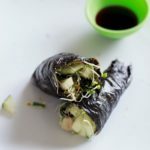 I also add seasoned sushi rice, but almost always overstuff my roll! It’s a fine balance to successfully add all the good stuff and get it sealed properly. Another good wrap is a rice paper. It’s larger and can hold more goodness! Thanks for the inspiration. I’ll be adding this to my weekly menu. Thanks for the tips! I do love rice paper too and find it easier to work with. I will have to try the rolling mat sometime! Haha I love this post. Thank you for making all the mistakes for me lol I’ll know what to do moving forward.